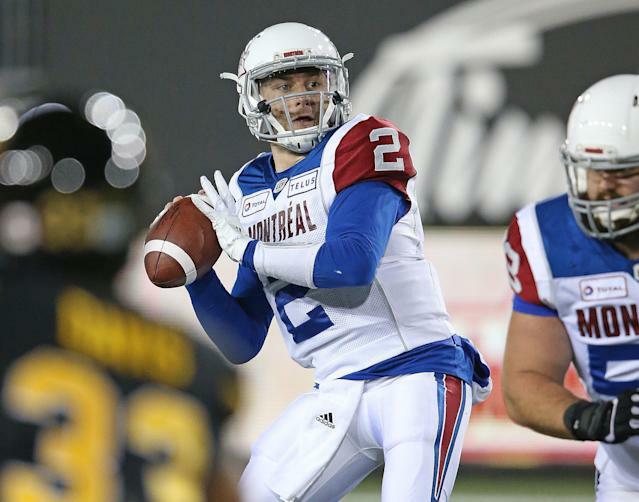 Manziel signed a deal with the AAF’s Memphis Express, the team announced on Saturday night. His rights had initially belonged to the San Antonio Commanders, however, they released his allocation rights, which opened him up to the league’s waiver system. Manziel was offered the chance to start working out with AAF teams earlier this month, and was reportedly contacted by the league within 24 hours of him being banned from the CFL. AAF chairman Tom Dundon said earlier this month that Manziel would not receive any special treatment in the league, and will get the same three-year, $250,000 deal that every player gets. The eight-team AAF is midway through its inaugural season this spring. The Express currently boast a 1-5 record, and were the first team available to claim Manziel based on the league’s waiver system. The Express have struggled to find a successful quarterback so far this year, which could provide Manziel a quick opportunity to take the field. They started with former Penn State standout Christian Hackenberg, who was drafted in the second round of the 2016 NFL draft by the New York Jets. Hackenberg threw two interceptions in the first half of the Express’ game against the Orlando Apollos last month before he was benched. They also lost quarterback Zach Mettenberger on Saturday, who left their 22-9 loss to the Salt Lake Stallions on the first play of the game with an ankle injury. Former Troy quarterback Brandon Silvers replaced Mettenberger in the loss in Utah. The 26-year-old former Heisman Trophy winner last played for the Montreal Alouettes in 2018, where he threw for nearly 1,300 yards, five touchdowns and seven interceptions in eight games. He spent two seasons with the Cleveland Browns after being picked up in the 2014 NFL draft, but went 2-6 as their starting quarterback.